Holly wishes for more than her boring life in America offers. When her parents and younger brother, Ben move to an English Village for the summer, Holly receives a peculiar iron key from the cottage's caretaker. 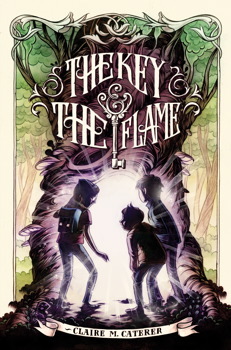 The key opens a door in a tree where Holly, Ben and their new English friend, Everett, end up in the medieval kingdom of Anglielle. Ben and Everett are taken prisoner in the castle and where Holly must learn to use the key which transforms into a wand to rescue them. Magical creatures both help and hinder Holly's progress. While the plot has substance and the characters and mythical creatures spark interest, the action lacks the excitement and suspense needed to carry such a long fantasy novel. Caterer paints a pretty picture but leaves out the crucial step of actually meeting the wizard-like antagonist, saving it for the next book in the series. The Flame & The Key will captivate the most voracious fantasy lovers, but the more fickle middle grade reader may put it down halfway through.